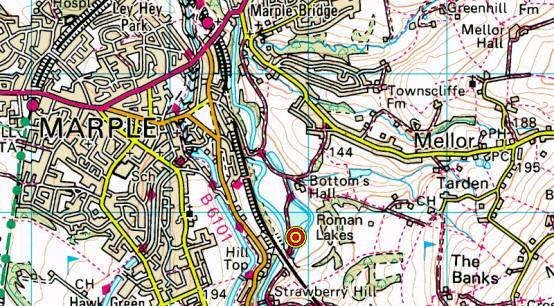 Evening bike rides from the Roman Lakes, Marple - starting 7.30 pm. Here are details of the route and a map. There's a blog report on the 18 September 2009 ride - here. The 17 October 2009 ride is reported on here. It's a 1-2 hour ride, or an equally enjoyable walk in 3-4 hours. 1 (SJ 969 878) Roman Lakes. Go to Roman Lakes Leisure Park from Marple (other routes are only bridleways) by turning down a steep lane off the B6101. Go under the railway and turn right twice along the unmade road to reach Roman Lakes after one km. Observe ducks etc on ornamental pond. Detailed directions. 1 -> 1 (12.46 Km) The ride starts out left from Roman Lakes and follows the track by the river, under the railway, then alongside the railway before emerging onto a track by a farm. Turn right over the railway then down to a T-junction where a right turn takes you to the B6101 at Strines. Turn left here* and after about half a km take a bridleway on the right immediately after a farm drive and before the river bridge. Emerge from this narrow track past the paper mill at a road. Turn left up the hill then right at a junction up to the canal bridge. Double back under the bridge along the towpath to the left, keeping on the towpath past the sweet factory. Turn left immediately after passing under the road bridge to join a small road that leads down to the main road (A6015). Go straight across and keep right at two junctions until the road ends at the Rock Inn. Take the track on the right down into The Torrs, crossing the River Goyt at the bottom (if you reach the picnic benches you've missed the left turn towards the Walkway) before turning left next to the river and crossing the Millenium Walkway above the river. Immediately after that go right up a steep path to emerge by New Mills railway station. Turn right up the narrow road to the top. Cross straight over and climb steeply up St Mary's Road, turning left onto High Lea Road. Keep on the road, passing through Brook Bottom before a further climb to a farm. Descend the hill, but take first right soon after the last houses (easily missed) at the next junction onto an ascending narrow sandy track leading to a wide track at a group of cottages. Continue down and then along the road across the golf course to a junction. Turn left, and keep left, following the access road down through the golf course until the tarmac runs out. Then straight on down through rocks, stones, gravel, drop offs, mud and ruts until arriving at the junction of Lakes Road, where a left turn takes you back to Roman Lakes Leisure Park. The only part of this ride that is 'off the saddle' is the steep path after the Millennium Walkway. It's a good, varied route, suitable for all. 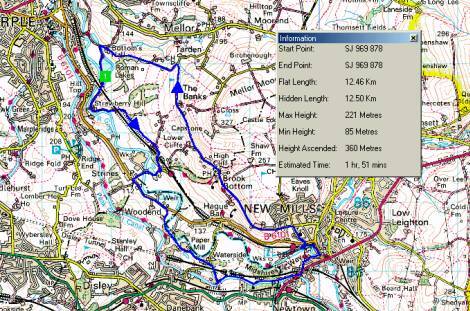 Allow a good two hours, including breaks, though a fit mountain biker would take well under an hour for this route. *If walking, cross the B6101, ascend to the canal, and turn left.